It’s difficult to believe that water can leave a stain on upholstered chair or sofa. When you think of stains on upholstery, you probably think of coffee, chocolate or juice stains, which is why you ask your family not to eat and drink in the living room. However, water stains on upholstery are surprisingly common. How Can Water Leave an Upholstery Stain? Water typically causes a stain on fabric chair or sofa when it isn’t clear and pure. Household water contains many impurities that don’t affect its safety to drink or its taste. Water has minerals and other microscopic particles that can cause staining when it interacts with fabric. Water stains may appear as light brown marks on your fabric chair or sofa. The stain might be in the shape of a ring if someone allowed a glass with a soggy bottom to rest on the arm of an upholstered chair or sofa. 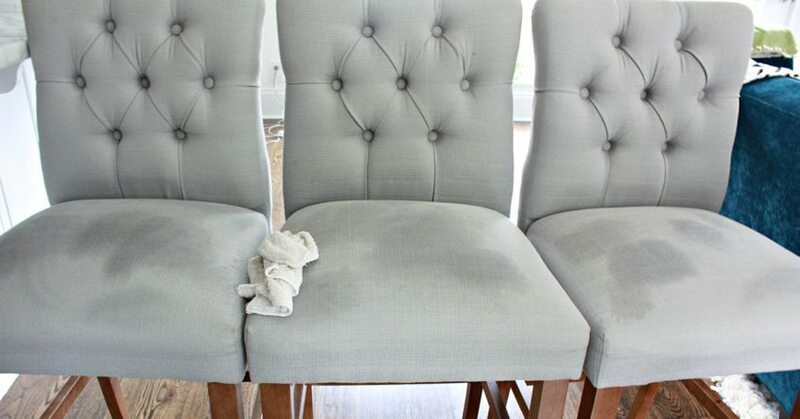 The water stain may simply be a collection of circles in various sizes if the water was accidentally sprinkled on the upholstered chair, or it may be a larger patch of discoloration if a water spill occurred. These stains usually show up after the water has been left to dry unattended. By the time you get around to removing water rings from upholstery, the water has long since dried. There are lots of suggestions online about removing water rings from upholstery. Unfortunately, it can be dangerous to attempt them without knowing for sure if your upholstered chair or sofa will not be damaged. This is especially the case if the upholstered chair or sofa is valuable. Some of the methods suggested online include re-wetting the water stain and “starting from scratch” to blot it and dry it with a hairdryer. This can be problematic because you might accidentally just create a bigger, more noticeable water stain than the one you started with. Another solution that you can find online involves using vinegar and baking soda to saturate the stain. In theory, this might work. Vinegar and baking soda work together and can “pull” the hard water deposits from the stain that caused the mark to appear in the first place. You would then blot the area with a clean cloth, rinse with water and dry vigorously with a cloth. If you do try any of these online solutions to removing water stains from an upholstered chair or sofa, be sure always to use distilled water. Distilled water contains no mineral deposits and few impurities so that it won’t leave a water stain itself. Of course, the only surefire way to treat stains on upholstery is to have the chair or sofa reupholstered. Chances are, your older upholstered furniture has many stains and marks that have accumulated over the years. Professionals like Embassy Cleaners can transform your old chair or sofa and give it new life that will last for many years to come. Contact us today for a free quote.